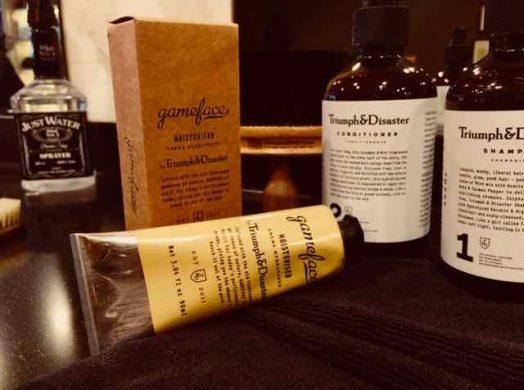 With the onset of Winter weather, now is the perfect time for us to unveil a new male grooming product to try from our Bristol men’s hair salon – from Triumph & Disaster, called Game Face Moisturizer. Every day exposure to wind, rain and colder temperatures reduces the skin’s natural ability to protect itself, with skin natural oils presenting a barrier to damage. Keeping moisture in skin cells is an essential for male grooming. Moisturizing regularly with high quality men’s skin care products helps to protect and nourish the skin – critical during Winter months. Game Face Moisturizer from Triumph & Disaster has been engineered to be light on the skin and easily absorbed. It’s a unique combination of Jojoba extract, Horopito oil, Ponga fern and Vitamin E, with a fragrance that is a musky mix of smoke and wood, according to Triumph & Disaster. It’s a superb moisturizer for men that gives extra tone to skin, as well as protecting the surface of the skin, hydrating, locking in good oils and keeping the skin condition enriched and healthy. To apply this daily moisturizing products for men, simply place a small amount onto palm of hand, then massage into face and neck in even, upward movements. Dry skin may need a larger amount, with oilier skin will need less. Triumph & Disaster Game Face Moisturizer is available to buy for only £34 in-salon, while stocks last, so come and get yours before it’s all gone! To find out more about Triumph & Disaster Game Face Moisturizer, please visit here. To see examples of male grooming delivered by our Bristol team, and to see other male grooming products we have in stock, please visit our barbering blog here.